Vietnam is an incredible country – full of diverse and delicious foods, varying landscapes from mountains to beaches to rice fields to towering karst topography. During our 30 days in Vietnam, we went from North to South at a slow-ish pace, trying to take our time as much as we could, but still packing our itinerary full of sites. This 30 day Vietnam itinerary will walk you through how we got around, where we stopped along the way, the sights I recommend most, and mistakes I made that you should avoid. If you want to know how much I spent during my trip to Vietnam (less than $50 per day for two people! ), head to this post: How Much Does it Cost to Travel Vietnam? Luke and I opted for the cheapest possible transportation: the hop-on hop-off buses. The ticket is called the ‘Open Bus’ ticket and you can buy it from any travel agent in Saigon or Hanoi. 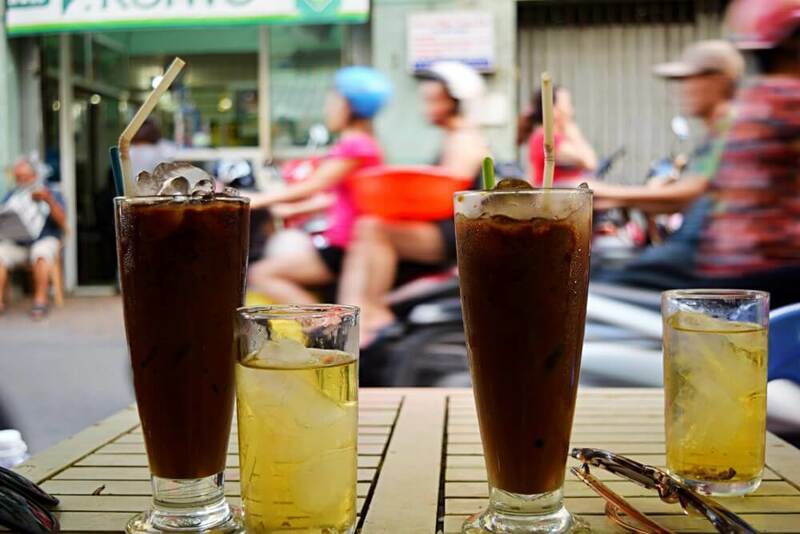 The most reliable, and therefore most expensive, companies are Hanh Cafe and Sinh Cafe (also sometimes called Sinh Tourist). We used a company called Queen Cafe (obviously they love cafes?). 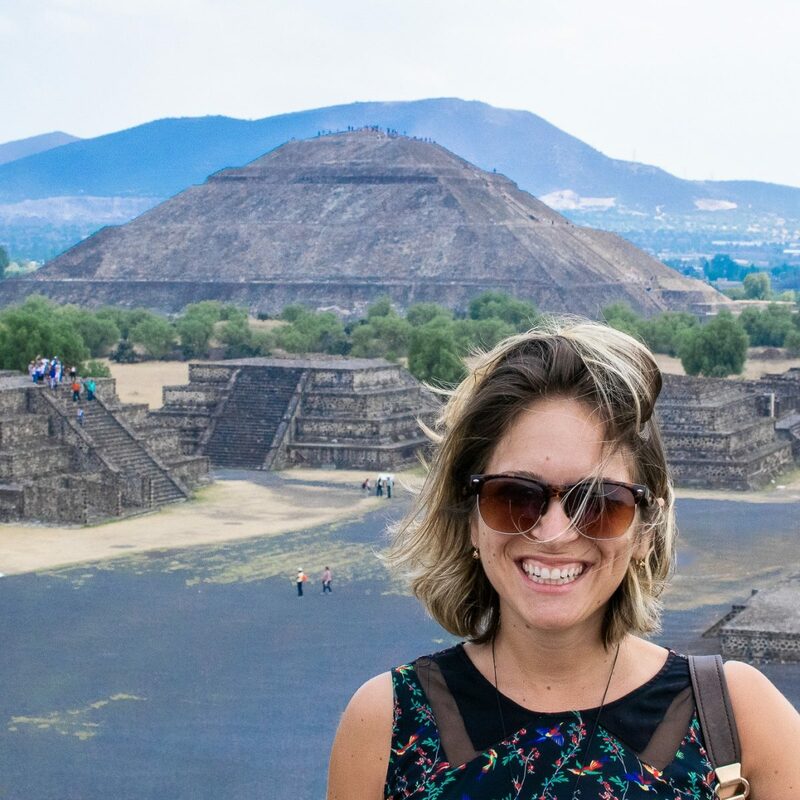 We paid $34 each for our ticket which included sleeper buses for each leg of the journey which, as a woman measuring less than 5 feet, I found incredibly comfortable. Anyone over 5’10” might find it slightly cramped. In short, I wouldn’t recommend using Queen Cafe if you are going to travel further south than Ninh Binh. The service changes hands from here and the company that takes over were rude, smoked on-board the bus, shouted at everyone who came on the bus if they didn’t go to the exact bed they were told to go to, and drove like absolute maniacs. If you are only going to travel around the north, the actual Queen Cafe buses were very clean, the staff were friendly and didn’t make any unnecessary stops. We arrived at the Hanoi Airport in the afternoon and took a communal van to the city center. When you exit the airport arrivals there are lines of different van companies that will take you to different parts of the city. 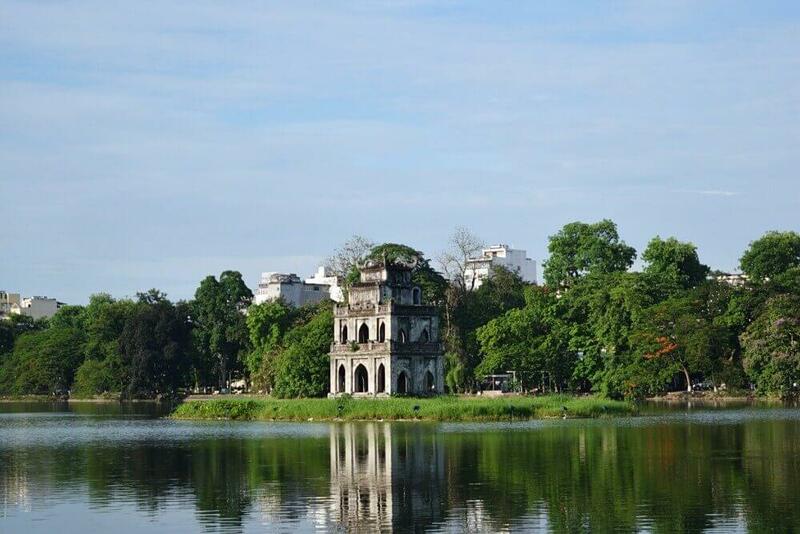 Many recommend the Jetstar van which takes you to Hoan Kiem Lake. We took the one next to it because it was leaving much sooner. It dropped us off a little bit south of there – it took about 15 minutes to walk to the Old Quarter and the whole trip only cost us $2 each (30,000 VND). Most of our time in Hanoi was spent sorting out the rest of our time in Vietnam. We spent an entire day going in and out of travel agents pricing things up. Our favorite was Friendly Travel. Some of my favorite sites in the city were the Hoa Lo Prison Museum and the Military History Museum. I wish we had gone to the Ho Chi Minh Mausolium, but it was closed on the day we went. Mostly though, I just enjoyed wandering the streets of the Old Quarter, stopping into coffee shops and supping incredibly strong iced coffees and browsing market shops for little trinkets. We drank 15¢ beers on Ma May Street in the evenings and ate so much street food I get hungry just thinking about it. Where we stayed: Hanoi Blue Star Hotel, 36 Phat Loc Lane, Old Quarter. The hotel was OK. For $10 we got a double room with bathroom and breakfast then next morning which was coffee and an omelette and baguette. It was run by a family while we were there and everyone was very nice to us. I would recommend this if you’re looking for cheap and cheerful in the center of it all. Scam Alert* We spent a hot afternoon sitting around Hoan Kiem Lake people watching. A very nice man with excellent English and a woman with limited English approached us and asked if they could practice their English with us. They were both in their early twenties. We agreed and got chatting. After about 20 minutes they asked if we wanted them to give us a “locals tour” of the city. We said maybe tomorrow and they gave us their phone numbers. When we got back to our hostel we googled it and found this to be a very common scam. Apparently if we met up with them, we would find ourselves in a situation where we were paying an awful lot for food/drink/taxi fares. Whether these two were genuine or not, we’ll never know, but it’s better to be safe in these cases. Be aware of this scam around Hoan Kiem Lake. 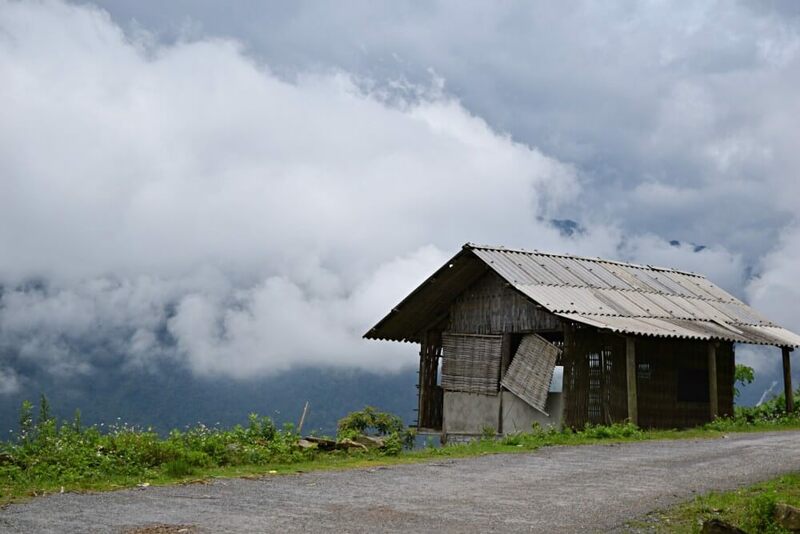 Most people visit this northern part of the country to hike in Sapa. That wasn’t my number one priority, but it is a really beautiful place to do it. For the three days we were in Sapa, we hiked, drank too much rice wine and laughed with a local Hmong Family. You can read about that experience here. It’s really easy to get to Sapa from Hanoi. We booked a $4 one way bus and got there in a few hours. On the way back, it was a bit trickier. If you book your ride back from Sapa to Hanoi at a travel agency in Sapa, be sure to get clear directions about where the bus will leave from (there seemed to have been several different locations, one of which was quite a walk away). Where we stayed: Bau takes bookings in advance, but only if you phone her directly. She cannot read English, so texting or emailing are not an option. If you would like to contact Bau and stay with her and her family during your time in Sapa, contact me and I can put you in touch. Halong Bay was a pain to plan. Everyone had warnings, horror stories to share. Every sign seemed to point us away from going – “too touristy” “horrible boat companies” “rats in the rooms”. We read so few positive reviews that we didn’t really know what to believe. For a short time we considered going it our own and getting a boat to Cat Ba to camp, but we quickly decided against it for the hassle of it all (there seem to be even more scammers there!). In the end, we went with Halong Imperial Cruises which you can read about here. It was an incredible experience in paradise. Something to note: If you want to spend one of the mornings cycling Cat Ba you MUST book it in advance with your travel agent. You cannot, as our travel agent thought, book it once you are on the boat. I didn’t really know anything about Ninh Binh until our travel agent told us about it. Granted, he got a bit more money for our open bus ticket by selling us more stops, but I’m still glad we added it to our Vietnam itinerary. 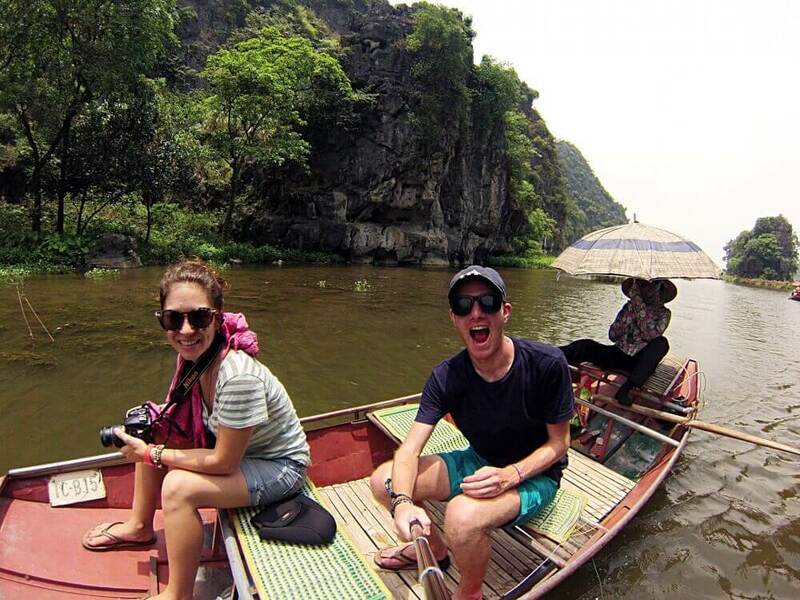 Famous for the boat tours in Tam Coc, there was more than enough in the surrounding area to fill several more days. 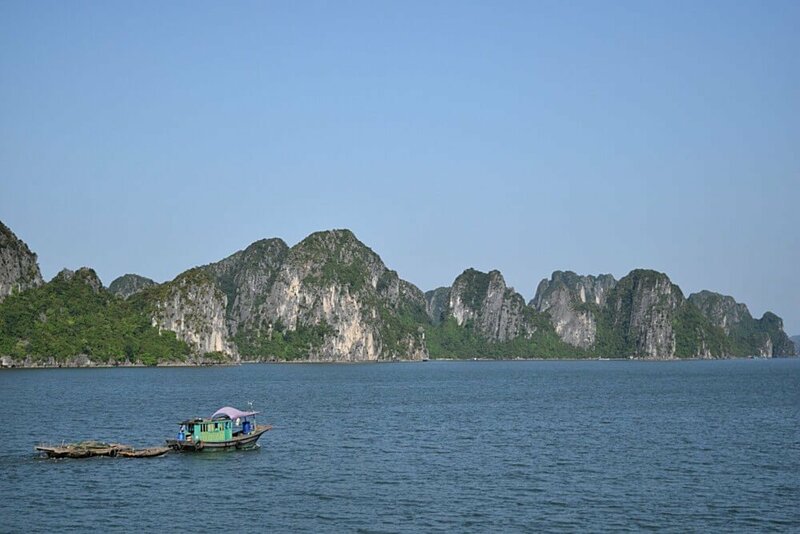 We rented a motorbike on our first day and road around the Trang An park area stopping to take in the immense views of the dramatic limestone cliffs surrounding us. We ate Chao Ga, chicken rice porridge, which quickly became one of my favorite meals in Vietnam. The second day we rented bicycles and rode to Tam Coc. It wasn’t very busy, it was just before lunchtime. We paid for our boat and walked to the small steps where a woman helped us into a boat and we were off! These women are incredible (there are some men, too!) because they row all day with their feet! When you get to the turn-around point, there are lots of people in boats trying to sell you over-priced drinks and snacks. It’s hot and it’s a nice tip to get your rower a drink. We’d read about this beforehand and just before we arrived we bought waters for all of us at a much better price. The rower then traded the water we gave her for a cold lemonade. We all won there I’d say. Where we stayed: We stayed at Queen-Mini Hotel. When we got off the bus that night, there was only one man there touting his hostel. We went with him. He claimed that the tour company where the bus stopped at was his company. We rented all of our transport through him and it was all a fair price. The room was fine, but no breakfast included. I really enjoyed Hue. It was a quick three days, but there was a lot to see. You could easily add another day to your Vietnam itinerary. We spent our first afternoon at the famous Citadel. It was SO hot and because of the random time we’d arrived in the city, we accidentally skipped lunch – so we (read: I) was incredibly cranky. The ticket to the citadel includes entry to the antiques museum, which I thought would be kind of boring, but was full of some really amazing artifacts – old armor, royal garb and shields and wood carved plaques (and the obligatory pottery section). The second day we went on a DMZ tour. Luke and I are both kind of big ole’ history geeks and we loved learning about the Vietnam war as we made are way down the country. The DMZ tour itself was kind of slap-dash. We were picked up around 7am and the drive to where the DMZ used to be is almost a two-hour drive. 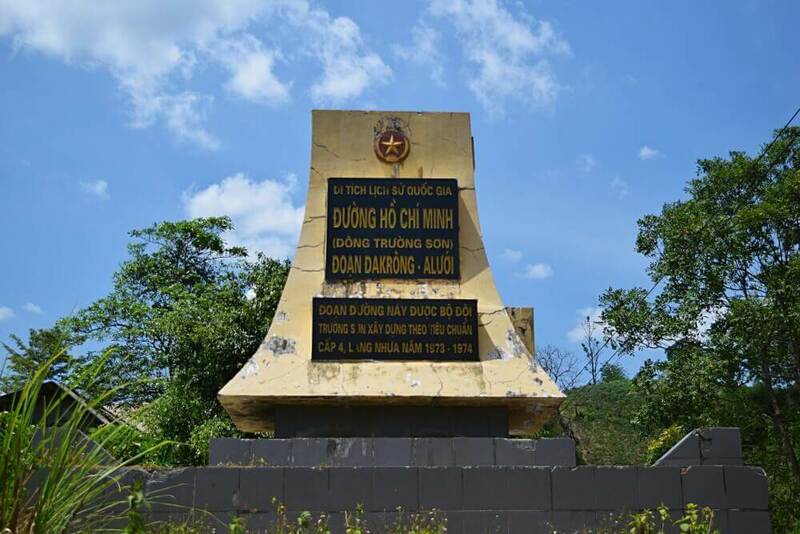 We stopped at the start of the Ho Chi Minh Trail, some battle sites, an old American air base (fascinating), an old set of underground tunnels that used to be a village, and a cemetery for unnamed soldiers. Where we didn’t stop was the actual DMZ. We drove slowly past the area as our guide pointed it out, but we never actually stopped. Big-time bummer. On our last day in Hue, we checked out the Tu Duc Tomb. Built by an old emperor for himself and his family, it is their incredibly ornate final resting place. The grounds are incredible and the tombs are beautiful and intricate. We rode bikes from the center of town which was slightly difficult without any gears, but really nice. Where we stayed: Google Hotel. The sign literally looks like the Google logo, colors and all. It was really clean and the breakfast, which was included, was awesome – any drink and any breakfast choice. We paid $10/night for a double room there. I was really looking forward to Hoi An. I’d read so much about it, so many people wax poetic about what an amazing place it is – full of culture and cafes and kind people. I found the people to be very pushy, the amount of consumerism a bit overwhelming, the shops all selling the same low-quality stuff, the architecture to be a little bit tired. I just felt a little bit… bored. We spent a day at the beach. We got clothing made which took about four days. Luke’s suit was incredible, my dress was very nice. The quality of both, so far, seems very good. We got boots made. The quality is questionable, but they do look really nice. We ate at a really great restaurant every morning for breakfast, Vi’s Cafe. The woman who ran it was hilarious and gave us some great tips about what else to do. We also had the best Banh Mi (baguette sandwich) that I had in all of Vietnam from the Banh Mi Queen. I’m glad we added it to our Vietnam itinerary, but I was disappointed. Where we stayed: Dai Long Hotel on Hai Ba Trung Street just outside the old quarter. There were a lot of “backpacker” style hotels on this street and this one was the cheeriest. The owner and his son were so, so nice. The rooms were really clean and it only cost $10. We spent a day in Nha Trang because it was an overnight journey from Hoi An and we wanted to get the hell off the bus. 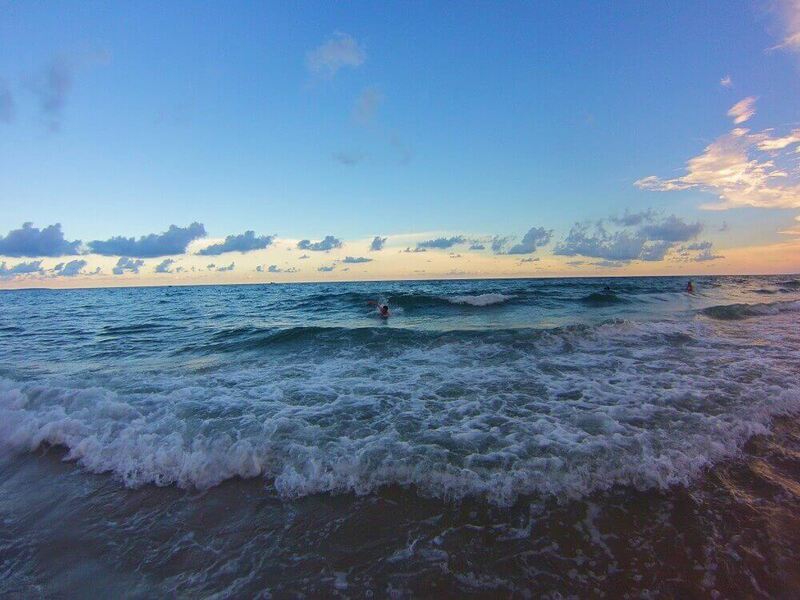 The beach is amazing – it seems to go on forever. We arrived at 6am, checked into a small hotel and were laying on rented chairs by 7 o’clock. I’ve never gone for an ocean swim so early in my life, but it felt so good after the terrible sleep we had on the bus. Where we stayed: Thanh Binh 2 Hotel. They came to tout business when the bus dropped us off. We said we’d check it out and they took us on their motorbikes to the hotel. It’s really near the beach and breakfast was included for $8 for a double room. They called our bus company to book the next bus for us and we were picked up right from the hotel. I loved Mui Ne. I don’t know what it was, but I could have stayed for so much longer. Maybe I was exhausted from the constant go-go-go of the previous few weeks, but we just chilled on the beach for four days. It was blissful. We rented a motorbike to check out the dunes where we paid to rent a few pieces of plastic to slide down on (not recommended). We ate ridiculously cheap fresh grilled fish every night. We drank cheap Beer Saigon and watched the sky turn from orange to purple to pink to navy in the evenings. We swam in the sea as the sun went down and slept all day in our little motel room. I was so happy there. Where we stayed: BB’s Guesthouse. It was really near where we got off the bus, a little bit away from all the other backpackers. It was quiet, the man who ran it, BB, was perhaps the nicest man I’ve ever met. 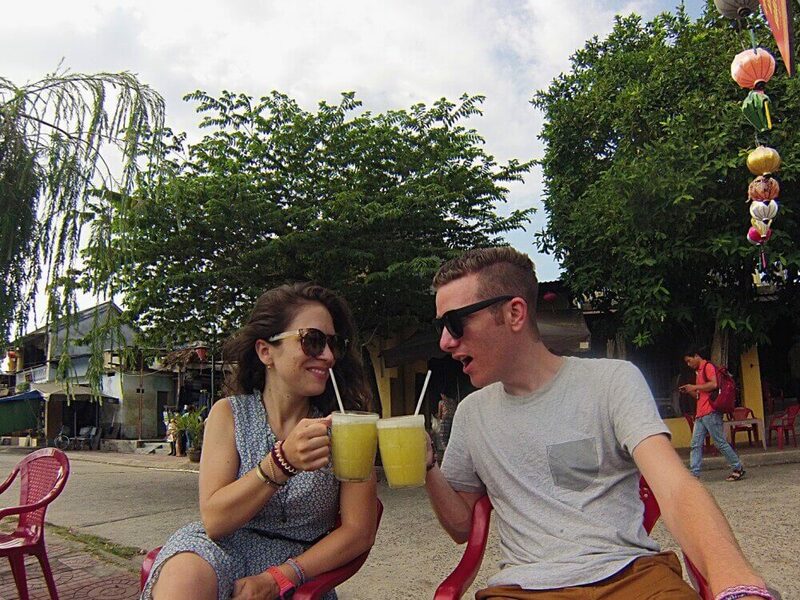 Last, but certainly not least, we spent six days in Saigon, or Ho Chi Minh City depending on who you’re talking to. I was worried it would be too much time in the city, but I could have stayed for six more. The food was the best in the entire country – so much street food, so many soups and ban cuon and Banh Mi to eat. We used Legal Nomads amazing Vietnam food post which brought us to some incredible eateries. There were plenty of sights too – the Botanical Gardens and Zoo were a nice day out, the War Remnants Museum was hard hitting, the Reunification Palace was an interesting take on history, and the old architecture of the Post Office and Cathedral were really fun to explore. We also did the Cu Chi Tunnels where the Americans and Southern Vietnamese fought against the Viet-Cong. It was a very sombering tour. Our tour guide was a veteran who’d fought here with the US Navy, although he was originally from Saigon. His stories were horrific, vivid and seemed still to haunt him. Where we stayed: We stayed at Madam Khan’s Guesthouse. She randomly approached us as we were walking in and out of guesthouses looking for the right price. She said she had a room for $12 which would include breakfast for us. It was tucked off Bui Vien, very clean, and we had our own balcony. Every morning Madam Khan would bring our breakfast and leave it in the kitchen for us to cook: eggs, a baguette and two instant coffees. This is difficult. I feel like each mis-step we had in Vietnam helped us to avoid others further on in the trip. Vietnam was the first country Luke and I have tried to explore in this way – a lot in a short period of time. I wish we had more time, mostly. I wish I could have stayed in Mui Ne longer, I wish we had more time in Sapa. I wish I had paid a few dollars more for Sinh Cafe or Hanh Cafe bus tickets. The bus journeys between Ninh Binh and Mui Ne were absolutely terrible. I wish I had spent more time getting to know Bau and her family, perhaps spending another day hiking or helping if we could in any way. I wish I had taken MORE PICTURES! Have you ever been to Vietnam? What did you do that you loved or hated? I’d love to hear about it in the comments! Thank you for posting this! My boyfriend and I are in a very similar boat as you two – currently staying in Hanoi planning the rest of our time in Vietnam, ready to slowly travel south. I really enjoyed reading about what you liked and disliked – thanks again for sharing! So glad this was helpful, Brittany. Vietnam is such an awesome country with so much to see! Let me know if you have any other questions!! I see you did not visit the Mekong Delta? What was the reason? And why did you like Mui Ne so much? There is not much to do, besides the sanddunes right?